Architects Alvar and Aino Aalto designed this house in the 1930’s as their home and office. The house is a home museum and both the house and garden can be visited during guided tours all around the year. Alvar and Elissa Aalto designed the studio as their office in the 1950’s. The remarkable architectural masterpiece building and garden can be visited during guided tours all around the year. Art museum and sculpture park by the seaside. The collection holds Finnish and international modern art and ancient artifacts from Asia and Central and South America. Changing exhibitions. Finnish art from 19th and 20th centuries, older European art and an ample collection of Helene Schjerfbeck’s paintings permanently on display. Changing exhibitions every year. The museum is situated in the castle-like studio, designed by the artist Akseli Gallen-Kallela (1865–1931). The exhibitions present his and his contemporaries’ art and life and contemporary art. The former residence of Finnish Presidents gives a glimpse behind the scenes of power and politics. The Villa is shown as it was in President Urho Kekkonen’s (1900-1986) day in the 1970s. 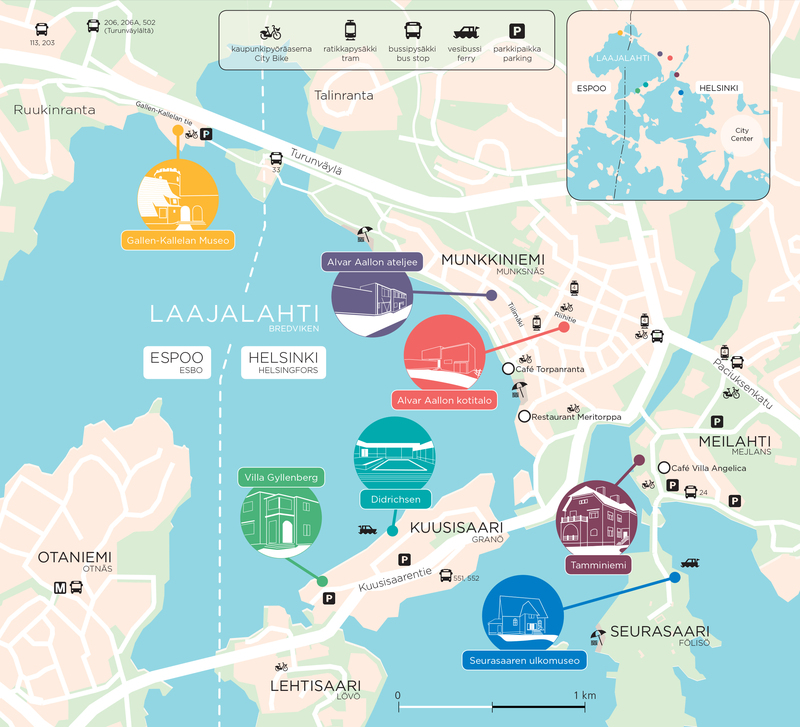 Seurasaari is the green living room of Helsinki. The Seurasaari Open-air Museum invites you to take a peek into the lives of generations past in traditional Finnish dwellings.